Conservatives are rushing to celebrate a tweet from Cher that has some thinking she supports Trump. President Trump and Cher seem to have found common ground. Over the weekend, Cher tweeted out against the idea that Los Angeles should welcome in more immigrants who Trump considered transporting to sanctuary cities. The singer, who is a staunch supporter of immigration rights, felt that her city should prioritize the current homeless population first. The two have notoriously been at odds for years, with Cher being one of the most vocal celebrity antagonists of Trump since he emerged as a presidential candidate in 2015. This somewhat odd agreement between the two public figures comes just a week after administration officials said their idea of sending migrants to sanctuary cities — a term used to describe places where local officials refuse to work with federal immigration officers — was rejected. However, the Trump administration is still exploring ways to make this happen in the near future. Trump spent his weekend framing the potential policy change through social media as a threat to Democrats if they do not work with him on federal policy changes on the border. Democrats must change the Immigration Laws FAST. If not, Sanctuary Cities must immediately ACT to take care of the Illegal Immigrants - and this includes Gang Members, Drug Dealers, Human Traffickers, and Criminals of all shapes, sizes and kinds. CHANGE THE LAWS NOW! His administration is pushing this unprecedented approach to handling immigration within the U.S. as a way to have more liberal cities “take on some of that burden in their communities,” according to Sanders. News of this idea has faced mix reactions across the nation. Liberal officials — like mayors of both Los Angeles and New York City — have continued to openly accept Trump’s threat as potentially good thing as they continue to posture as safe places for those navigating federal immigration policies. In the wake of Cher’s tweet, many high profile conservatives rushed to label her as a new Trump supporter. However, the singer has not made any further comments on the matter — but provided more clarity in a follow-up tweet to one supporter. "There must be a process. Ppl who are looking 4 asylum,& Qualify,must be given access 2 judges,&properly interviewed," the singer tweeted to a supporter. "Then They can be sent”EVENLY” 2cities  .Not Just THOUSANDS Bussed 2Calif,NY,Etc 4 revenge. These are ppl.WE ARE SANCTUARY CITIES BECAUSE WE DONT THROW PPL 2 DOGS." 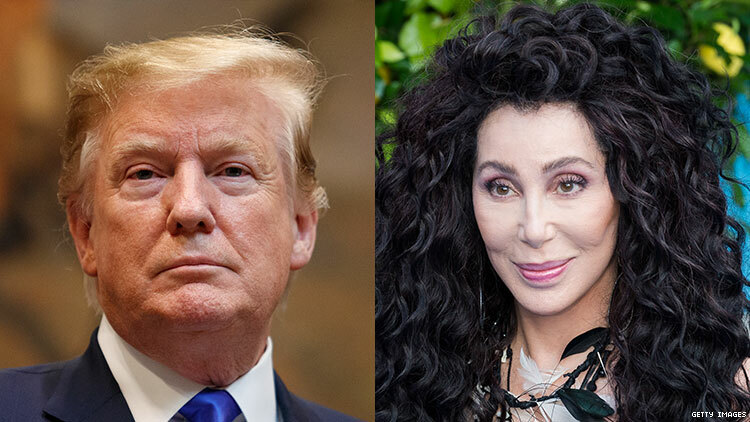 So, it seems like Trump has not really yet gained the support of Cher — and most likely won't any time soon.